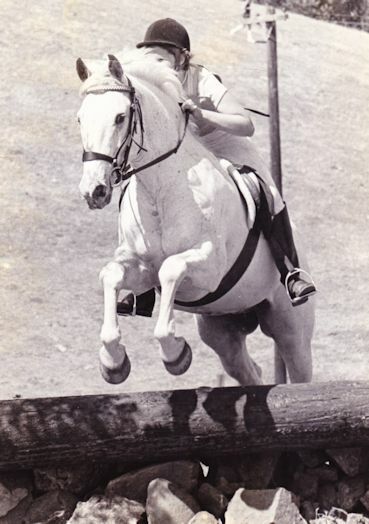 My start was in Eventing, here with Wicki. 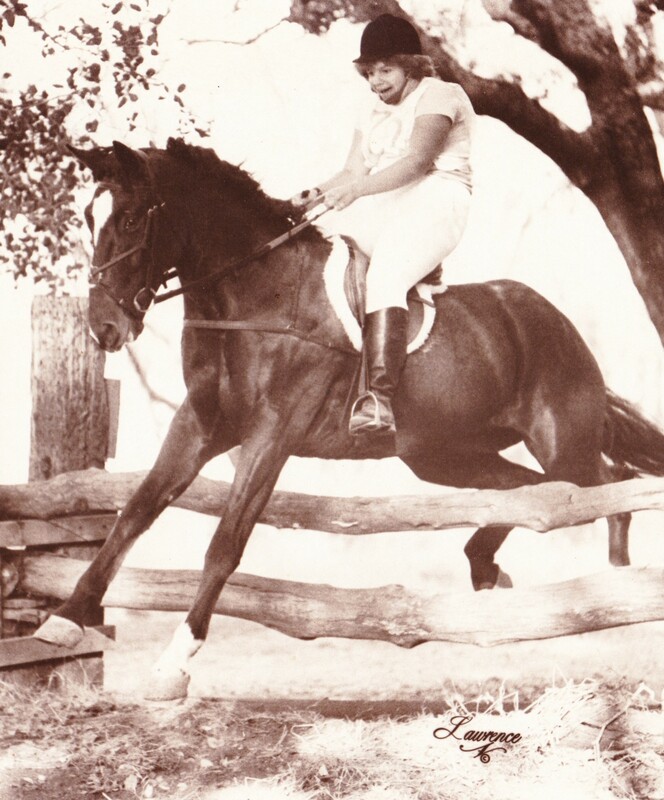 My first horse sport was Eventing. It was a growing sport in our state, and its lack of formality appealed to the university crowd I grew up riding with. Wicki came with miles under his girth, and was a great teacher. 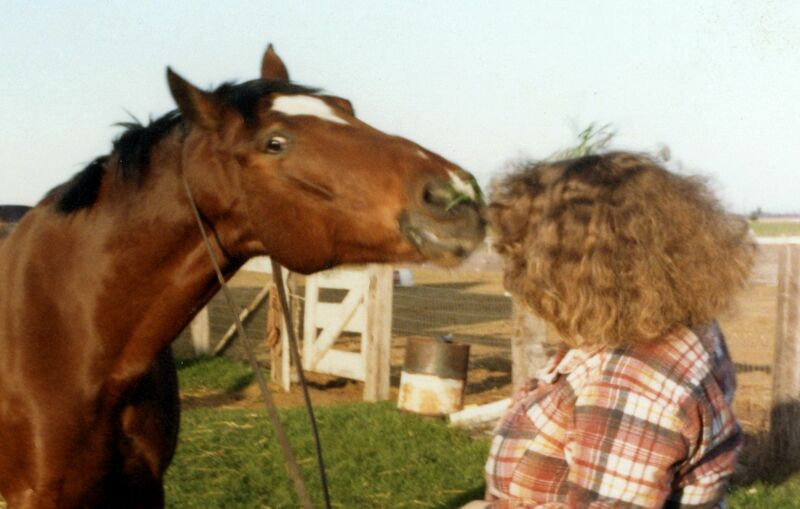 When I outgrew him, the plan was to get a younger horse that I could take further. Enter Ben, a perfect candidate for a successful Eventing career – great temperament, very nice movement, and a jump that felt it could clear the moon. But talent is only part of the equation. Ben was a horse with very definite opinions, and my attempt to make him an Event horse left me with a mystery that lingers to this day. There is no doubt that pairing a teenager with a young, green horse is a risk. My education, at the time, was not what it should have been – in hindsight. But, I’d spent a few years riding a range of horses at the university riding school; then I had two good years of competition experience with Wicki. The reality was, we could not afford anything with a high degree of training. Besides, we fell in love with Ben’s face when it poked over the door of the stall when we went to try him out. Ben and me, still youngsters. We clicked early. I did my best to do my homework and prepare Ben (show name Bendigo) for a career in Eventing. Our first three-day event foretold the future – he needed encouragement from the ground to even get him out of the start box! Nearly every fence began with him stopping or slowing twenty to thirty feet away. About two thirds of the fences were eventually successful, after much pushing and encouragement. There was apparently a call, over the public address, for me to pull off course – but I never heard it. I did have to pull out of the way for at least one rider to pass, but I was determined to finish what we could! I had schooled Ben over whatever cross-country fences I could access in the area, but it seemed clear that he needed more exposure. So, we set out to find all of the one-day events we could catch rides to (we had no trailer of our own). Our results were very mixed. On some courses he rode like a dream, jumping everything that came up, and eating up the course with his lovely gallop. At other events, he wouldn’t leave the start box, and I was lucky to get within twenty feet of most of the fences before he plant his feet lift his head, and refuse to proceed. As this went along, we got better in Dressage, and began to ride stadium jumping courses smoothly with consistently clear rounds. 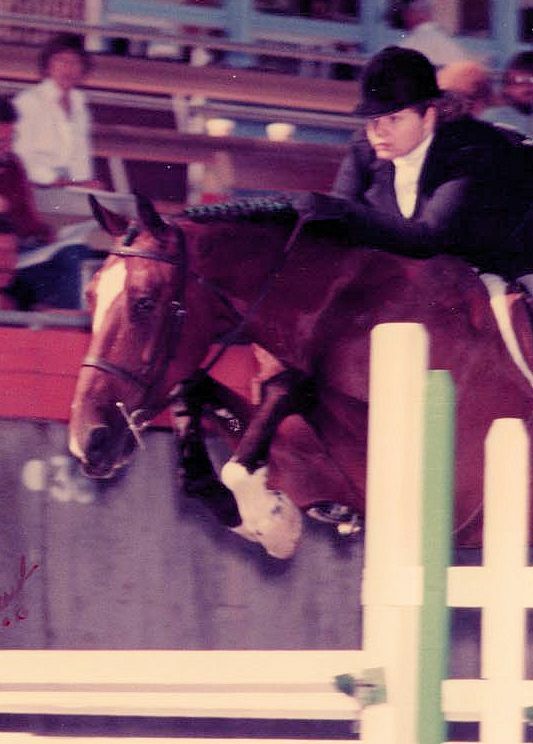 Hunter/jumper shows were far more common, so we would show in those whenever we could. There was no doubt that Ben not only had scope, but he had exceptional form as well. So, we began to pick up ribbons in hunter classes. Ben was also built to be quite handy, so we won our fair share of jump-offs as well. The next Three-Day event was a slight improvement over the first. This course passed through some forest area, and he was cautious when visibility was low. But, he tackled most of the fences boldly – save for the one pictured at right. This fence appeared around a bend, and was the one stop he made – which he immediately followed by jumping it from a stand still! As you can see, I was not fully prepared for that decision! It felt like we were making progress … until the next one-day event, in which we were back to not being able to get out of the start box! A vague pattern began to emerge – and it seemed to be tied to the location. There were some facilities, like Concord and Dickson Ranch, where he seemed to be comfortable. If he liked the facility, it didn’t seem to matter what we faced him with. I had a lesson on the Concord course in which we easily tackled even Preliminary level fences. Yet, I went to a clinic at another facility that he took a dislike to, and I could not get him to step down a one foot high bank! Repeat performances at the ‘preferred’ facilities were consistent – but each new facility was a gamble. Unfortunately, there was no pattern to the facilities themselves. He liked some that were wooded, and some that were open – and disliked some that seemed comparable to those he liked. I never had such facility-related challenges in either the Dressage or jumping arena. For two years I struggled to find the key to changing Ben’s attitude. I wanted desperately to Event, and he clearly had the talent. And so I persisted in perhaps the most frustrating equine challenge I’ve ever encountered. Nothing we tried worked. No instructor seemed able to find the key. As our relationship deepened, this problem yet persisted. Ben finally had the last word at the last one-day event that we attempted. It was a new facility in the foothills area. It was a lovely and simple course, laid out in a partially cleared wood. We had a nice Dressage test, and I was hoping the course would be inviting. It took the better part of a minute to get him out of the box, and we didn’t get within twenty feet of the first jump – an 18-inch log on the ground – when the brakes went on. He had no intention of getting any closer to that terrifying log – versions of which we’d jumped hundreds of times. I tried for one more fence – no dice! I no longer had the will to fight, so I withdrew. We were sitting on the hillside watching stadium (I’d pulled out, since there seemed little point) when insult was added to injury. A well-meaning woman, who we knew from the university, stopped by to suggest that perhaps Ben and I just weren’t a good fit. I tried to explain that in all other areas we got along famously, and were beginning to be successful – but she came back with our cross-country problems being proof that we didn’t fit each other. She left with advice that we consider selling Ben and getting a horse who was a better personality fit. I knew she meant well, but the thought that I might be the cause of all of the problems left me in tears. It happened that we had a hunter/jumper schooling show the next weekend; and it happened that the same woman who’d lectured me was competing there as well. We traded wins throughout the show, and ended up going head-to-head in jump-offs in the last three classes – of which Ben and I won two. It was a fun day, and confirmation of the decision I’d made earlier in the week – that I would rather give up Eventing than give up Ben. As I dismounted after the last class, the “bad fit” woman came over to talk to us. “I owe you an apology,” she said. “I was wrong when I said that you two were not a good fit. Watching you in action, today, you two clearly have a great partnership. I wouldn’t want my comments to result in that partnership being broken up.” I was surprised and deeply touched by her apology. I assured her that we’d been talking about our options, and had decided that Ben was family and not going anywhere. We would stick to hunter/jumper shows and my continued journey in Dressage. She was pleased, and suggested that someday I would return to Eventing when I found the right horse. I never went back to Eventing, but I never regretted it. Ben and I had many years of showing over fences, even picking up ribbons in A-rated shows, despite not having a regular trainer until near the end of our show career. I refused some amazing offers from hunter trainers – my best friend was not for sale! We even developed a fan base – a friend went into a local tack store to buy a nameplate for Ben for Christmas, and the lady behind the counter asked, “Is that the Bendigo?”. My friend shrugged at which the lady mentioned my name, and said she followed us at all our shows. By age nineteen, it was clear Ben could no longer make the distances that had been lengthening with the introduction of warmbloods to the showring, so we hung up our flat saddle. Through the years, Ben also tolerated my learning Dressage. He never made it easy. Of course, my early education had been poor, so we had both labored for quite a while under that handicap. When I eventually got my act together, I was able to correct my past mistakes sufficiently to turn him into an upper-level schoolmaster who then helped my mother learn Dressage. Twenty eight years is a long time together, and I could probably write an entire book about my adventures with Ben. But I will always be grateful to him for teaching me that it is up to the human to determine if the activity they have chosen actually suits the horse they have. I believe that many issues I see stem from selecting an activity the horse doesn’t actually enjoy. It could be from poor training, or just preference (we have personal preference, why wouldn’t they?). Either way, force too often enters the picture, and creates misery for both horse and rider. If you find that you and your horse truly struggle, it might be worth considering whether another activity would be a better fit. If you are set on the activity you are doing, consider the advice I was given, and find a better activity for your horse and a better horse for your activity. There is nothing more upsetting than to believe you may be causing your horse distress. But there is nothing more rewarding than finding an activity in which both you and your horse find pleasure! This entry was posted in My Journey and tagged Ben, cross-country, Eventing, horse behavior, Horse training, training problems. Bookmark the permalink. Happy horse = happy rider. There’s a lovely eventing horse on Warwick Schiller’s website who was rearing, stopping, and turning. His take was basically that the horse was “barn sour” to use the term loosely and has started the owner/trainer on a course of listening to the horse, reading calming signals, and letting the horse choose where he wants to work and rest (not the crude drilling and making the horse move fast in the comfortable area so that they want to be anywhere else but just doing the work they need to do for that day, calmly and reasonably). It seems to be helping the horse relax and feel supported by her human. Just an interesting study (and still a work in progress) FWIW. The trainer is the one who feels like she has benefitted by slowing down and not having so much of an agenda but working with the horse in front of her. That sounds like a very good approach! (I do hate that crude drilling that you mentioned, and is used too frequently). I often wish that I could start over with Ben again, with the 40 years of knowledge I’ve gained since … the outcome would likely be very different. Thanks for the comment, I will check it out. Don’t we all wish we knew then what we know know…and yet there is always more to learn. It sounds like you did as well by him as you could have–moving to what he was more comfortable with. I have a lot of respect for that! You are do right, Kim! And thank you.